Patients experiencing pain, numbness, or lack of circulation may benefit from specialized Anodyne Therapy. Our office offers this unique service and is readily available to utilize the simple and pain-free equipment during our regular in-home physical therapy sessions. You may ask your doctor or contact our Clinical Director with any questions about this service. Living with CHF or COPD is challenging for you and your loved ones. Proper education and management of these conditions is crucial for maintaining a healthy lifestyle and avoiding unnecessary hospitalizations. 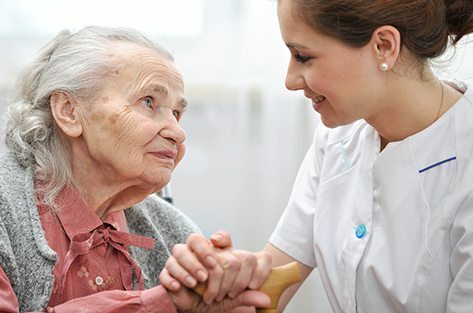 As an affiliated provider with the Alzheimer’s Association, we understand the unique needs of patients suffering from disorientation and memory loss. Our team of caregivers is equipped to serve your loved one with patience and compassion. Our team of trained professionals is keenly aware of those factors which may lead to avoidable falls in a patient’s place of residence. Help us help you reduce the risk of falls and steer clear of pain or surgery. Our goal is to get you right back on track with optimal mobility after a knee or hip replacement. We can provide an evaluation to determine the best services that will ensure a complete recovery, and then match you with a therapist the will best fit you needs. Dealing with chronic pain is one of the most difficult aspects of aging and other health-related conditions. Our team will ensure communication takes place among your multiple providers and will play a vital role in the management and reconciliation of your medications. Patients suffering from Parkinson’s or other neurological disorders can experience relief through therapy programs designed for maintenance and prevention of accelerated decline. As a contracted provider with behavioral health plans, we are able to offer behavioral health and mental healthcare services by a team of experts trained and educated to handle the unique needs of those stricken with these disorders.